The challenges of contemporary societies demand new theoretical approaches that integrate social with environmental and life sciences. Evolutionary Governance Theory is a theoretical framework that adds new insights to now fashionable work on complex adaptive systems. During this meeting we will discuss novel ways to understand change and evolution in governance and how these can be used to design interventions that enhance the reflexive and adaptive capacities of governance. ABOUT THE BOOK: Evolutionary Governance Theory (EGT) is a novel perspective on the way markets, laws and societies evolve together. It can be of use to anyone interested in development, markets, public sector reform, public administration, politics and law. Drawing on a wide range of case studies on three continents and a variety of conceptual sources, the authors have developed a theory that clarifies the nature and functioning of dependencies that mark governance evolutions. EGT delineates in an entirely new manner the spaces open for policy experiment. As such, it offers a new mapping of the middle ground between libertarianism and social engineering. Theoretically, the approach draws on a wide array of sources: institutional and development economics, social systems theories, post-structuralism, actor- network theories, planning theory and legal studies. The book can be downloaded here. 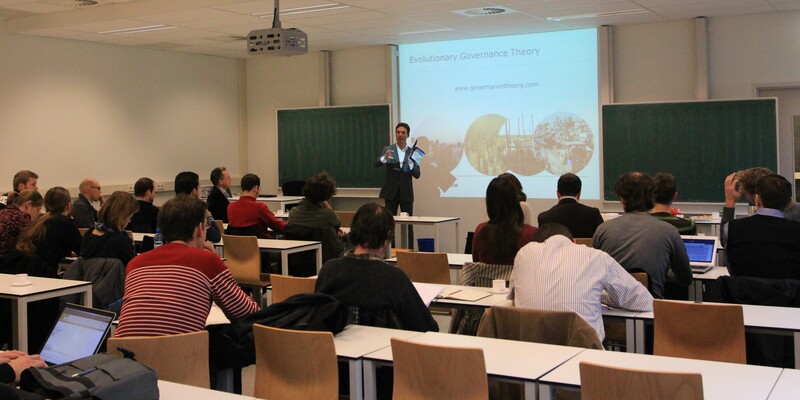 Van Assche, K. , Beunen, R., Duineveld, M. (2014) Evolutionary Governance Theory: An Introduction. Heidelberg: Springer. Kristof Van Assche is interested in evolution and innovation in governance, with focus areas in development, environment, spatial planning and design. He is currently Visiting Associate Professor in Strategic Communication, Wageningen University, and Research Fellow at ZEF/ Center for Development Research, Bonn University. Teaching and research in various countries in Europe, North America, the Caucasus and Central Asia. His work is often comparative in nature, including a fieldwork component and theoretical reflections. Raoul Beunen is researcher at the Strategic Communication Group of Wageningen University. He works on Evolutionary Governance Theory in the fields of natural resource management and spatial planning. His research explores the potentials and limitations of environmental policy and planning in the perspective of adaptive governance and sustainability. He studies the implementation of planning and environmental policies in different institutional settings and investigates the importance of path dependence in enabling new perspectives in policy landscapes. Martijn Duineveld is Assistant Professor Cultural Geography at Wageningen University, The Netherlands. He works on Evolutionary Governance Theory in the fields of geography and urban planning. He is especially interested in the dynamics of power, knowledge and places. He teaches in courses on human geography, research methods, cultural geography, empowerment, sustainability, landscape architecture and planning. He is active in both academic and societal debates on citizenship, governance and democratisation.